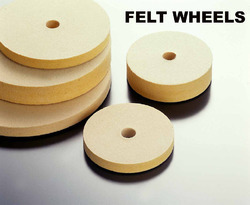 We are a leading Manufacturer of felt polishing wheels from Mumbai, India. Our square Felt Polishing Wheels are made from 100% wool, having thehighest quality available. Felt wheels can be used with polishing compounds such as Rouge, Tripoli, and etc and use these with diamond compounds and metal polish. Soft, Medium, Hard, Rock Hard and Flint Hard.Diameters from 3" up to 18" and widths from 1/2" to 2"
All wheels are supplied without a bore, however has a pin hole centered on the wheels. When ordering, please indicate the bore size required for your selection. Standard bore sizes are 1/2", 5/8", 1" and 1-1/4". Looking for Felt Polishing Wheels ?